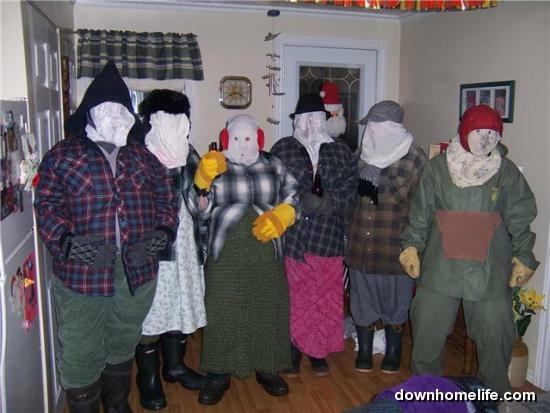 Jannying (or mummering) is a tradition from Newfoundland that had nearly died out until popularized in a song by Simani. I had never actually seen a janny until I became one myself. Traditions varied from location to location, but back home at least people would dress in in old silly clothing, wearing scarves and long underwear on the outside,often stuffed to disguise both gender and size. Once dressed you would go from home to home, singing, stomping, and generally being silly while the people tried to guess who you were. Jannys usually spoke with an indrawn breath as well in order to disguise thier voice. Once you had been guessed the hosts generally shared some form of alcoholic beverage (mmmm Aunt Lil Pelly’s slush) and a piece of cake or cookie and then often picked up more members from that house and moved on to another. The one side effect of Jannying I remember, other than a hangover, was the in and out from warm to cold while wearing warm costumes caused chills from the cooling sweat. Am sure many a flu was contracted! Today in some locations the tradition seems to be being replaced with a mummers parade. While I like the parade concept, I am not sure I want it to wholly replace the tradition either. Please share any mummer stories or pictures you have!